APPLY NOW! Applications due May 5 and/or May 11! Many of our programs are currently recruiting. See the column on the left to see which teams you can apply to now! Get notified about our intern recruitments and more by signing up for our email newsletter and following us on Facebook. In the meantime, check out all the possibilities by exploring our Learning by Leading™ programs below. Leadership skills and real-world experience combine to help our students address the earth’s most important environmental issues. 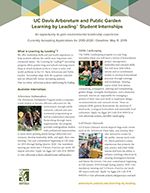 The Learning by Leading™ internship program offers quarter-long and school year-long internships in which students work in a team to solve real-world problems in the UC Davis Arboretum and Public Garden. Internships correspond with the UC Davis academic schedule and are offered fall, winter and spring quarters. Summer internships are offered on an individual basis, in coordination with staff mentors. Students in this program can graduate with . . .
Central Valley gardening, drought-tolerant landscaping, habitat restoration and California native plant cultivation experience. Knowledge of horticultural best practices, plant propagation, landscaping, education, and community outreach experience. Highly-transferable leadership, team-building, and 21st century professional skills. Strong mentor relationships with staff experts and earn recommendations to support future endeavors. Knowledge organizing events that engage volunteers, visitors and other community members. A new network of students engaged in improving our campus outdoor spaces and positively impacting our planet’s environment. This program seeks to empower youth leaders to become effective advocates for the environment through public outreach, environmental and conservation education, and networking through many organizations. In this program students gain hands-on leadership experience with irrigation technology, research and smart landscaping. This team's focus is developing a new SmartLawn landscape demonstration area at the Western Center for Agricultural Equipment. 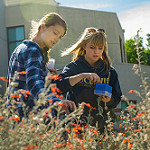 In this program, interns learn a variety of horticultural, project management, and outreach skills as they maintain community-based edible garden projects on campus. 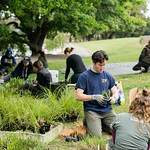 GATEways Outreach interns work closely with Arboretum Staff to support large-scale events such as the Arboretum Plant Sales, and develop their own interactive events for the public. Habitat Horticulture interns will learn about species interactions and the ecological benefits of gardens in urban environments and be trained to actively engage with the community when they are on site. Museum Education interns research and create interactive, interdisciplinary learning experiences in the Arboretum and Public Garden. Interns will learn best management practices and the current science of restoring and managing natural systems as well as low water-use, sustainable landscapes using the principles of adaptive management. Work with professional Arboretum nursery and plant sales staff to gain hands-on experience working in a nursery. Interns will learn methods for propagating a great variety of plants, many of which are unusual in cultivation. Our S.E.E. (Steward, Engage, Explore) Putah Creek interns will gain experience in the management and stewardship of natural lands which will provide them with a deeper connection and understanding of the Putah Creek Riparian Reserve and the riparian and upland ecosystems within it. Hands-on training includes irrigation design and installation, planting design, plant selection and installation, and long-term maintenance. Students will also be responsible for leading an independent project. Interns will become familiar with land and water management concepts of sustainable environmental design, storm water management, and native habitat restoration in an urban setting.